We do our best to be green all year around and not just by giving new life to items that would otherwise have made it to the landfill. We’ve installed electric vehicle chargers at our stores, we have energy management systems for our HVAC that ensure we maintain equipment for maximum efficiency and use as many environmentally-friendly cleaning products as we can. Bookmans Sports Exchange has given us a chance to open a new store that is as in-line with our core value on the environment as possible. We repurposed materials for building like the maple bowling lanes that are now our trade and sales counters as well as our bathroom counter tops. 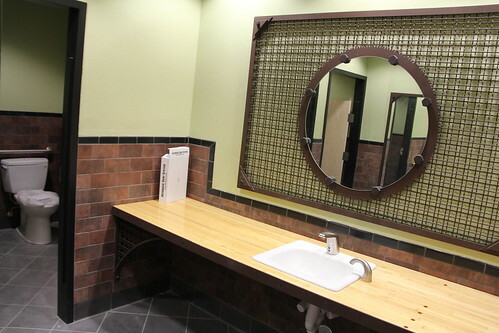 We’ve used scrap metals to create the vanity mirror in the bathroom. 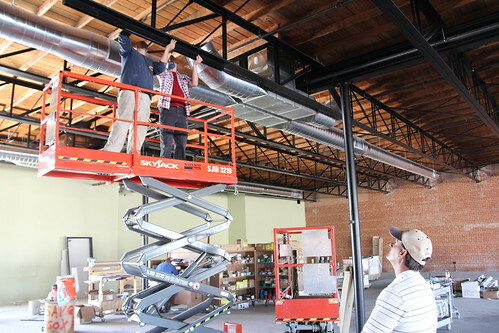 Repurposing materials means that we’ve reduced the trash burden on our community, but it has also helped us create a gorgeous vintage industrial feel in the store. A gentle footprint requires more than conscientious building. It’s also about how we use our natural resources in daily living. 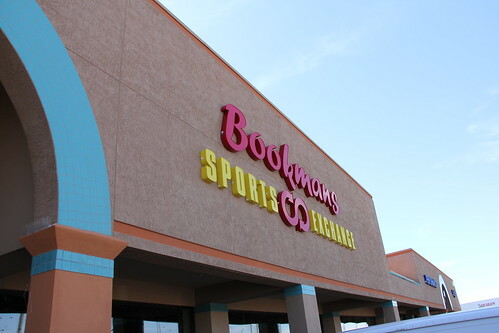 We’ve installed energy efficient T5 lights at Bookmans Sports (we also use this lighting in Bookmans Phoenix) and we are continuing our promise to have an electric vehicle charger at all our stores. To aid in powering the lights and car charger, we’ve installed solar panels. Living in the desert gives us a special appreciation for water. Our bathrooms have auto sensors to ensure that we only use the water we need, when we need it. Additionally, we have Elkay water fountains that can be used to refill your water bottle, reducing the need for one-time-use bottled water. 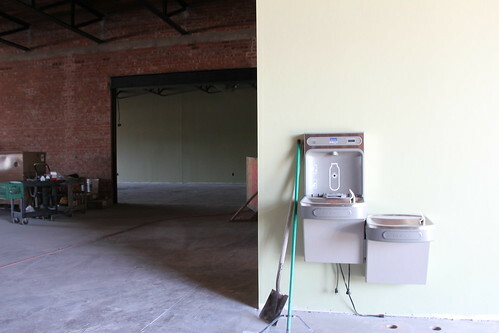 Our drinking fountains are filtered and the water has been refreshing as we work with all the dust that accompanies opening a new store. Take a look at our Flickr gallery to keep on top of our progress and check back here for our opening date. We hope to see everyone ready for a healthy sports, fitness and outdoor lifestyle that is compatible with the environment.